DO NOT FORGET THAT IT IS DANGEROUS TO OBSERVE THE SUN WITHOUT SPECIAL PROTECTION! The only completely safe way is to project an image of the sun on a white surface (for instance, a piece of paper or cardboard). 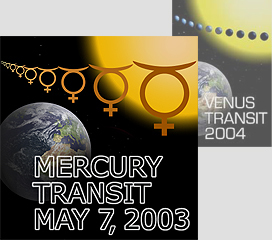 The 2003 transit of Mercury is now finished. The following ones will be in 2006 and 2016. But be prepared for next year's Venus transit. Note also the eclipse of the Moon on May 16 and the partial eclipse of the Sun on May 31. THE end of the transit! Image from ESO Webcam. 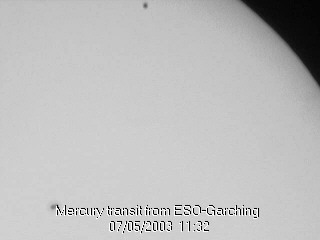 The last moment when Mercury was still fully in front of the solar disk. Mercury is the tiny black dot on the right. A series of images were made at ESO through a Webcam. 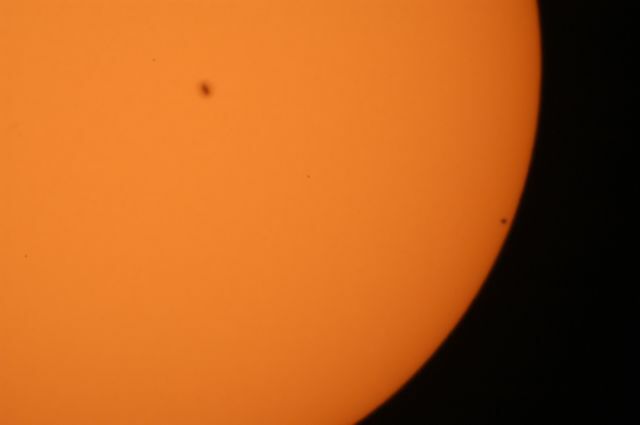 These images were made with a Meade LX200 F6.3 telescope equipped with a solar filter, a Barlow lens, a camera Nikon D-100 with CCD RGB of 12-bits and a maximal resolution of 3008x2000 pixels. Some images taken by our active observers are available on this page . 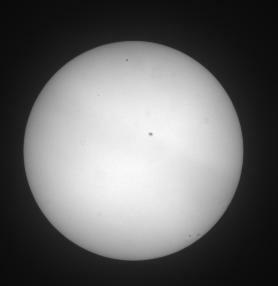 You could also follow the progress of the transit as seen from various other locations. Here are links to other web sites that showed the transit. A selection of Q&A's is available from the "Mercury Transit Hotline" which was in action during the event. 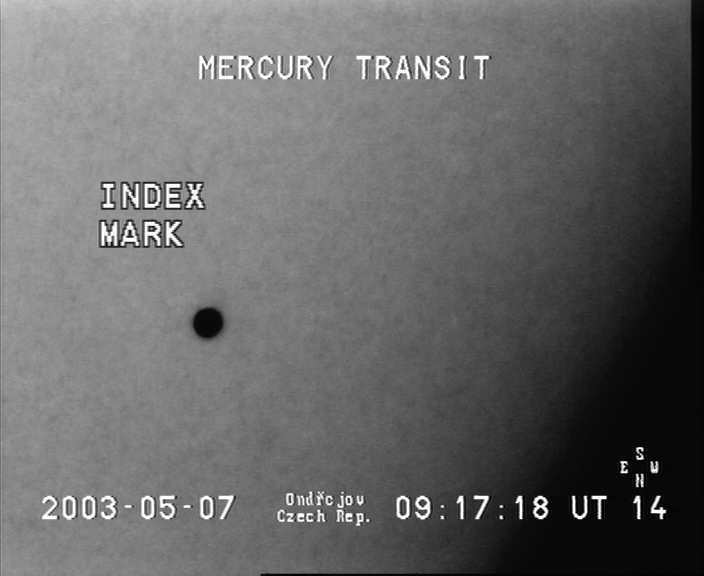 On Wednesday, May 7, 2003, the planet Mercury passed in front of the Sun as a small dark point. This rare "Mercury transit" was visible from Europe, Asia, Africa and Australia at every place where the Sun was above the horizon and the sky was clear. 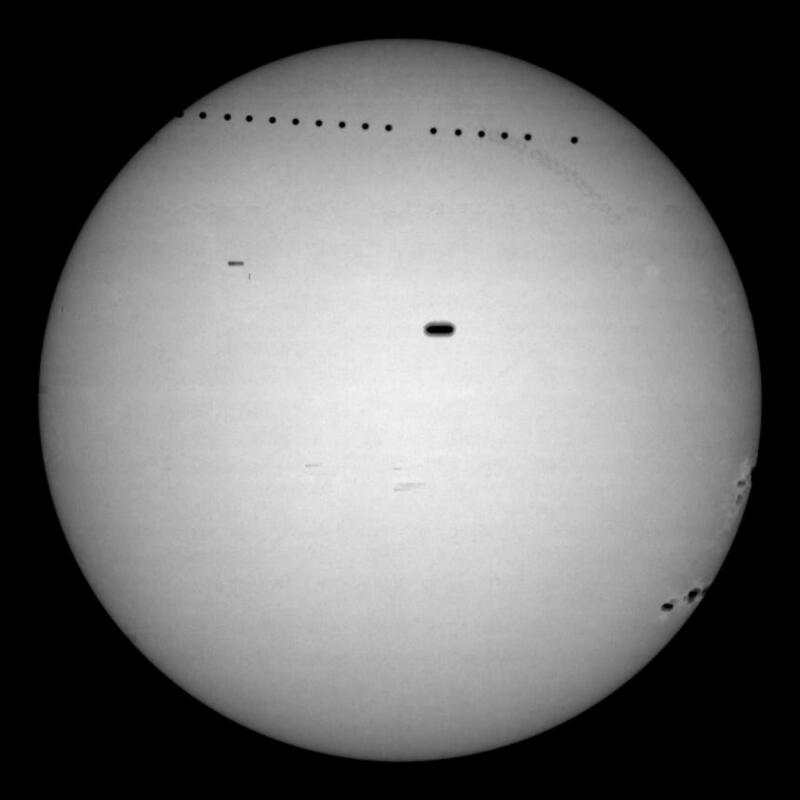 The transit began at 07:11 hrs CEST (Central European Summer Time), or 05:11 hrs UT (Universal Time) in the morning and ended at 12:32 hrs CEST (10:32 UT). Here is a collection of images obtained in different places. Composite of images taken by the GONG Network from India at 9:32 UT. Image taken by F. Delplancke at Garching with a C8 telescope.